Last week I lost my Internet connection. It was very disconcerting. I felt as though I had been thrown into a virtual prison and placed in solitary confinement. I had to run to the library to check my email (and, all right, put in an appearance in my online games). So while I could have worked offline on the computer, I decided it would be a good time to reread Electronic Life: How to Think About Computers. Michael Crichton published the book in 1983, and parts of it are obsolete. But the bulk of the book is Crichton’s exploration of the philosophy behind computers and our use of them. I began to realize that first-time computer users needed help with something not covered in most books and manuals - namely, an attitude to take toward this new kind of machine. How to think about computers, not just how to use them. In Electronic Life, Crichton discusses computers with his usual prescience so it’s not surprising that most of the book is relevant to thinking about computers 28 years later. Two of the entries made me smile when thinking about my recent technological mishap. 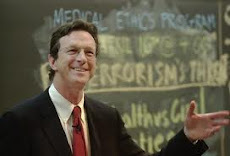 What is your favorite Michael Crichton book? My favorite of all of Michael Crichton’s books is his autobiography Travels. My favorite of Michael Crichton’s novels is Timeline.